"Neil Quailand takes down scores. That's what he does." So says the voiceover on this high-line slot from innovative slot developer Betsoft Gaming. If that sounds like a line straight out of Michael Mann's film, Heat, it's no accident. It's certainly from the 1995 crime masterpiece that this slot takes its lead. Heist sees you stepping into the shoes of professional bank robber, Quailand, and it's your mission to bust the bank and take off with 9 million of someone's hard-earned cash. Here there are plenty of brooding looks, slick suits, and a lovely metallic sheen to everything; there's even a determined detective character who's hot on the trail of our anti-hero. 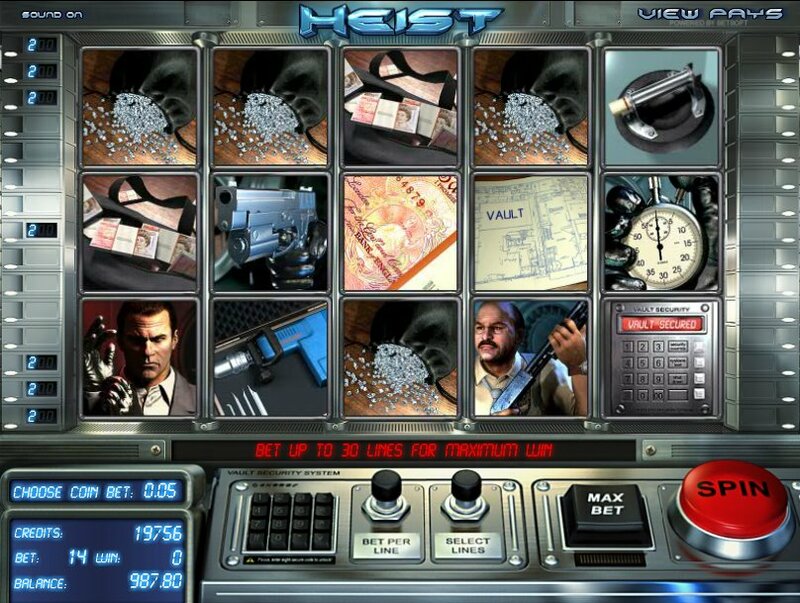 In fact, the 5-reel, 30-payline slot includes everything from the Hollywood crime-film textbook: Quailand, his nemesis, Detective Kowalski, diamonds, vaults, locks and bank blueprints, plus a load more symbols in keeping with the heist theme. The game area even resembles a hi-tech bit of vault-busting kit. 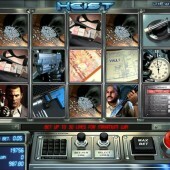 The scatter is the key in Heist, and is the glass cutter symbol. Get three or more of those and you'll trigger the bonus game where you have to pick from one of three diamond glass cutters. Each one conceals a different prize, so choose carefully. Another exciting feature is the Wild X2 Reel. If you get C4 on the centre reel, it explodes to make the entire reel Wild. Not only that, you'll get a 2x multiplier on your wins to boot. Finally, there's a Vault Bonus feature which sees our man try to take down his haul. Get three vault symbols on the reels and it will trigger the game where you have to choose your method of entry: will it be the drill or explosive? Tough decisions. A neat animated cut-scene then sees Neil blow the safe and start packing his bags full of dough. It's up to you to keep Neil grabbing cash until you decide to make a run for it. Go too early and you could miss out on lots of money; stay too long, however, and you could risk being nabbed by Kowalski. I've never been to the offices of Betsoft but I bet there's a sign on the wall that says, 'Thou Shalt Not Design Ugly Slots' as everything here looks a treat. The creators of Brazilian samba-fest, At the Copa, and the noir-ish After Night Falls have weaved their magic once again with this cool-as-f**k slot. There are some nice bonus games, and a seriously cool atmosphere make this worth a look, although - as with some of Betsoft's other slots - the lack of a big jackpot is the game’s main downfall. Fans of Sheriff Gaming's 3D crime-themed slot, Piggy Bank, will lap this up, however. For a Heat fan like me, however, I loved every minute of it, and I'll be coming back for more.